So do I. I wonder very much. Just as when Christianity tells me that I must not deny my religion even to save myself from death by torture, I wonder very much what I should do when it came to the point. I am not trying to tell you in this book what I could do -- I can do precious little -- I am telling you what Christianity is. I did not invent it. And there, right in the middle of it, I find 'Forgive us our sins as we forgive those that sin against us.' There is no slightest suggestion that we are offered forgiveness on any other terms. It is made perfectly clear that if we do not forgive we shall not be forgiven. There are no two ways about it. What are we to do? It is going to be hard enough, anyway, but I think there are two things we can do to make it easier. When you start mathematics you do not begin with the calculus; you begin with simple addition. In the same way, if we really want (but all depends on really wanting) to learn to forgive, perhaps we had better start with something easier than the Gestapo. One might start with forgiving one's husband or wife, or parents or children, or the nearest N.C.O., for something they have done or said in the last week. That will probably keep us busy for the moment. - C.S. Lewis, Mere Christianity , 1952. "That a group of medieval theologians ushered modernity into the world is an irony that should not go unnoticed. But for those who love the Middle Ages and the patristic East, these cultures represent an integrated sensibility prior to the onset of anthropocentric modernity and the long withdrawal of God from western culture. That people of faith should drink deeply from these wells is hardly objectionable. "Here’s the problem. Modernity happened. There can be no going back. What is needed is a new synthesis, a vision that can encompass the subjective individual with divine being." "Dwell upon the thought of our Lord, Who in His Ascended Humanity looks down upon all men, but most particularly on all Christians, because they are His children; above all, on those who pray, over whose doings He keeps watch. Nor is this any mere imagination, it is very truth, and although we see Him not, He is looking down upon us. It was given to S. Stephen in the hour of martyrdom thus to behold Him, and we may well say with the Bride of the Canticles, 'He looketh forth at the windows, shewing Himself through the lattice. '[Song of Songs 2:9]"
- St. Frances de Sales, Introduction to the Devout Life. On Thursday of this week, His Beatitude Christodoulos, the Archbishop of Athens and All Greece, was presented with two links from the chain that is traditionally thought to have been the chain that bound St. Paul. This post is made up of a few Scriptures, and a meditation from the late Lutheran Pastor Richard Wurmbrand whose organization The Voice of the Martyrs works with persecuted Christians, mentioning the bond of Christians today with the chains of past martyrs, as if bound with them, and quoting St. Thomas Aquinas. "We also are compassed about with so great a cloud of witnesses." A Christian prisoner in Cuba was asked to sign a statement containing accusations against brethren, which would have led to their arrest. He said, "The chain keeps me from signing this." The Red officer replied, "But you are not in chains." "I am," said the Christian; "I am bound by the chains of witnesses who throughout the centuries gave their lives for Christ. I am a link in this chain. I will not break it." Thomas Aquinas, after having called martyrdom the greatest proof of perfect love, adds: "Words pronounced by the martyrs before authorities are not human words, the simple expression of a human conviction, but words pronounced by the Holy Spirit through the confessors of Jesus." Learn from the martyrs. You too are a link in this chain. Remain faithful! Nijole Sadunaite, a young Christian lady, said before the court in Lituania when she was sentenced for her faith: "This is the happiest day of my life. I am tried for the cause of truth and love toward men. . . I have enviable fate, a glorious destiny. My condemnation will be my triumph. I regret only to have done so little for men. . . . Let us love each other and we will be happy. Only the one who loves not is unhappy. . . . We must condemn evil, but we must love the man, even the one in error. This you can learn only at the school of Jesus Christ." This is the teaching which the Holy Spirit gives you through a sufferer for Christ. Apply it in your own life. - Richard Wurmbrand, Reaching Toward the Heights, Living Sacrifice Books, Bartlesville, Oklahoma, 6th ed. 1992, daily devotion for April 25 (ellipses in Wurmbrand's original). Dr. Robert Moynihan spoke last night at Our Lady of the Rosary Parish in San Diego, together with Francesca Tomassetti. I was able to sit through the first part of it but had to leave around 8:00 p.m. to catch my train home. Dr. Moynihan is the founding editor of Inside the Vatican Magazine. Francesca Tomassetti is Director of the Oral History Project. Dr. Moynihan had offered to make his presentation without compensation, except for a collection that was taken up at the end of an hour. After the hour, we took a half hour break for the Rosary that was prayed at 7:30 in the church, downstairs from the meeting, because a number of people wanted to participate in that. I suppose he stayed for at least another hour after 8:00 p.m. The topics mentioned in the announcement for the evening included the vision of Pope Benedict, relations between the Russian Orthodox and the Roman Catholic Church, and the launch of the Oral History Project. The hour I was able to attend was devoted to discussing the Oral History Project, so unfortunately I missed the other topics except to the extent that they were briefly mentioned at the beginning of the presentation. The Oral History Project presentation was fascinating, despite technical difficulties with the video. You can watch a trailer for the video, giving the gist of the project, here. On October 16, 1943, German soldiers were told to find and arrest Rome's 10,000 Jews for deportation. They could only find 1,000 of them. The others are thought to have been hidden in Catholic religious houses, schools, and private homes. The Oral History Project is trying to locate those people who are still living who were among the Roman Jews who survived that era, and to videotape their stories for archives. The stories of those people's lives are expected to help to present a fair and accurate history of the role of the Catholic Church in Europe during the war. According to Dr. Moynihan and Francesca Tomassetti, there were Jewish men hidden by nuns and Jewish women hidden by monks, as there was no restriction requiring the men's religious houses to hide only men, and no restriction requiring the women's religious houses to hide only women. This could not have happened without papal approval. The efforts quietly undertaken by Pope Pius XII during the war can be seen in such efforts, quietly undertaken. The U.S.C. Shoa Foundation Institute already has an archive of 49,000 visual records at the University of Southern California. Clips of the testimony of survivors of the Shoah can be watched online at their website. Other archives are kept at Rice University, Yale University and the University of Michigan. Steven Spielberg established the Survivors of the Shoah Visual History Foundation in 1994 to videotape and preserve the stories of Holocaust survivors and witnesses to document the holocaust for future generations to learn from it. The importance of keeping an accurate history of these events is shown from the fact that some people have tried to deny that it really happened. The Oral History Project launched by Dr. Moynihan and Francesca Tomassetti is intended to provide additional records of those Jews who were assisted by Catholics, and particularly those in Rome. The time frame in question would be from 1943 to 1944, and people alive today who would have been there to witness these events would now be about 70 years old and older. It is important to collect as many of their memories on videotape now while that is still possible. "Always make your way before God and before yourself. God takes pleasure to see you take your little steps; and like a good father who holds his child by the hand. He will accommodate you. Why do you worry? . . .
"Walk joyously, my daughter, with a tremendous confidence in the mercy of your Spouse, and believe that He will lead you well; but let Him do it." - St. Francis de Sales, letter to Jane de Chantal, from Thy Will Be Done: Letters to Persons in the World. August 18 is the U.S. memorial of St. Jeanne ("Jane") de Chantal (transferred from December 12). St. Jane de Chantal was left a widow with four children at the age of 28. St. Francis de Sales became her spiritual director. She founded the Congregation of the Visitation. "I say to Thee whatever they say." "Saint Ignatius was once travelling with several of his companions; they each carried on their shoulders a little bag, containing what was most necessary for them on the journey. A good Christian, seeing that they were fatigued, was interiorly excited to relieve them; he asked them as a favour to let him help them to carry their burdens. They yielded to his entreaties. When they had arrived at the inn, this man who had followed them, seeing that the Fathers knelt down at a little distance from each other to pray, knelt down also. When the Fathers rose again, they were astonished to see that this man had remained prostrate all the time they were praying: they expressed to him their surprise, and asked him what he had been doing. His answer edified them very much, for he said: "I did nothing but say, Those who pray so devoutly are saints: I am their beast of burden: O Lord! I have the intention of doing what they do: I say to Thee whatever they say. " These were afterwards his ordinary words, and he arrived by means of this at a sublime degree of prayer. Thus, my children, you see that there is no one who cannot pray--and pray at all times, and in all places; by night or by day; amid the most severe labours, or in repose; in the country, at home, in travelling. The good God is everywhere ready to hear your prayers, provided you address them to Him with faith and humility." An article in Homiletics & Pastoral Review last year, titled St. John Vianney's Pastoral Plan, by John Cihak, speaks of the saint's ministry as a blueprint for a present day pastoral plan. 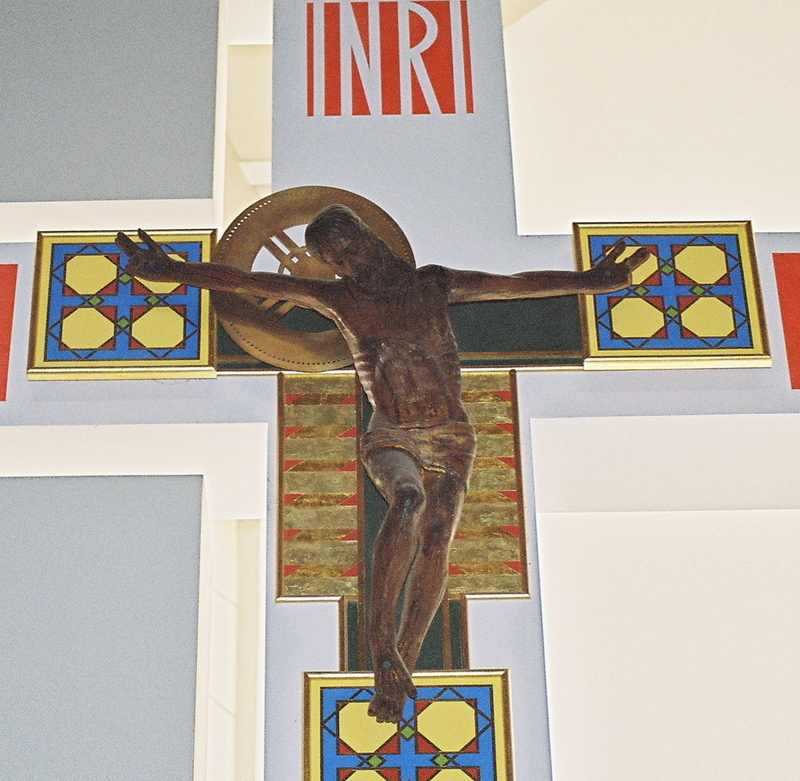 Picture: Crucifix from Church of the Nativity, Rancho Santa Fe, California (bronze Spanish corpus on a cross designed by Renzo Zecchetto). Often, when countering heretical views around us, our first reaction is a defense of the faith. Certainly, that is worthwhile, but often we should spend more time praying. Argument is not enough to stop the spread of bad ideas, as much as it is helpful in showing them to be logically what they are: bad ideas. Those who are insistent upon carrying them out will do them anyway. It has happened in the past, when the person in the room or in the office or on the committee who knew that others were making the wrong decision has said so and has had nothing to show for it but the right to say "I told you so." It has happened in wars too, when the feeble ability to have said "I knew it was the wrong thing to do" is a helpless cry while others are left to ask, "Then why couldn't you convince us at the time?" This week, the Episcopal Church USA has its General Convention 2006, and decisions they will make will impact the future of the Anglican Communion and the future of Catholic-Anglican dialogue. The dialogue, it seems sure, is no longer to be one of two similar forms of Christianity moving toward reunion, but rather two walking side by side in discussion of ideas but without the expectation of ever becoming one again. That is so not only because of events in the United States but also because of events in England, as Cardinal Kasper mentioned last week in connection with the Church of England's expected vote to have women bishops. What those Catholic-minded among them may do may be of greatest concern for Catholics now. We can all pray for them in their search and in their reflections over what should be their future path. It is not our only concern. The move of secular society and bodies such as the Episcopal Church in a direction opposed to truth and opposed to orthodoxy, opposed to those things always understood to be holy, is another. Ultimately, we pray for God's will to be done on earth as in heaven. 2. For the Lord to protect those who are fighting for truth from the temptations of the world, "and stop their ears in order not to hear the siren's song on this dangerous sea." "But behold, my Lord, that You are a God of mercy; have mercy on this little sinner, this little worm that is so bold with You. Behold, my God, my desires and the tears with which I beg this of You; forget my deeds because of who You are; have pity on so many souls that are being lost, and help Your Church. Don't allow any more harm to come to Christianity, Lord. Give light now to these darknesses." Her words in that Chapter were directed to rumors then in Spain about the Huguenots in France, probably without much accurate detailed knowledge. The understanding she had of the Reformation (churches being destroyed, the sacrament taken away, and some priests lost) are not overstatements of what is wrong with some of the true heresies of our own time. Surely, we pray for many detailed things in this environment. Among them, surely, should be those things in St. Teresa's 2-item list. "The Evening of the Visitation," by Thomas Merton, from The Marian Library/University of Dayton - page on the Marian poetry of Thomas Merton. 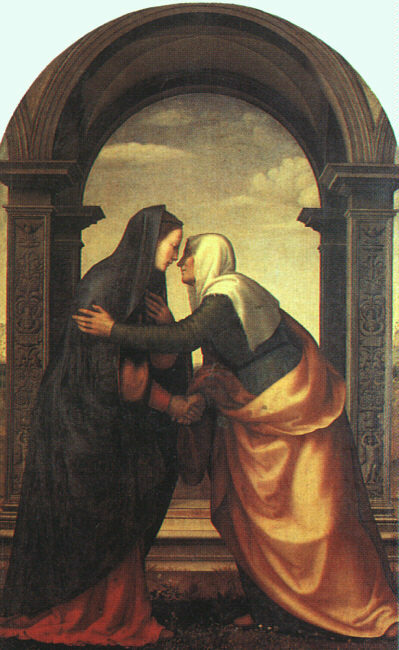 Picture: "The Visitation," by Mariotto Albertinelli (1474-1515), from Chemin d'amour vers le père.